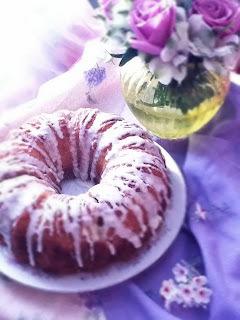 Olive oil cakes seem to be the rage among my fellow foodie friends. And the other night, I needed a quick and easy cake to bring to an impromptu dinner party. I think we have all been there, right? Well, a few olive oil cakes I have seen required beating eggs and whites separately, which did not mean “easy”. But I came across a cake by Cat Cora from the Food Network that had a European flair to it. It reminded me of cake I enjoyed in Savoy, France that my Great Aunt made for us during our visit (and I still cannot replicate in the U.S. :[ ). It seemed a very “mix it all up, bake it and go” kind of thing. So I started there. But I wanted to add a Rosemary undertone, similar to an olive oil cake recipe my colleague raved about recently. I also wanted to play with an Elderflower liquor that we discovered. It has a grapefruit flavor that I thought would match with the citrus nicely. So this is the adaptation. A few notes, what you see here is a bundt. The original recipe required a 10 inch cake pan. I did not think that was big enough to hold all the batter, unless it was a springform pan. This cake did not want to come out of the bundt pan, AT ALL. So it did break as I finally got it to release. The drizzle covered up the cracks. But I would recommend you use a well greased and floured 10-12” springform with parchment paper. Also, I used dried Rosemary in this recipe versus fresh. It makes the rosemary undertones very subtle. If you want a little more Rosemary punch, I would go fresh with it. The oils from fresh leaves will give it a brighter Rosemary lift. Steep your Rosemary first, because you want to infuse the milk as you do the other steps. In a small saucepan, heat the milk until near boiling. In a 5” square piece of cheesecloth, place the dried Rosemary and wrap it in a bundle, tying the top with twine. Place in the pan with the milk, and swirl it around. Take off the heat and cover for about 30 minutes to one hour. Swirl it around every so often. Heat oven to 350˚. Make sure you have a rack in the upper middle of the oven. Spray your pan with nonstick olive oil spray, and place a piece of parchment along the bottom, cut to size. Spray again and lightly flour. Set aside. Sift together in a small bowl the flour, baking powder and soda and salt. Set aside. Now add the flour mixture, and whisk until just combined. Don’t overdo it. Pour into your prepared pan, and bake for about 1 hour, or until toothpick comes out clean. Let cool for 10 minutes on a rack, then release from the pan and let cool completely. In small pan, heat up the Elderflower liquor until just to boil. In a mortar and pestle, crush the dried Rosemary and crush. (If using fresh, just mince up the leaves.) Add the Rosemary to the liquid, and take off the heat. Let sit and steep for about an hour. Add it to the sugar, whisking with a fork. Add the milk, and whisk until the glaze is drizzling consistency. You may need to add a touch more milk until it is right. With a fork, drizzle the top of the cake with the glaze and serve. This cake would make a fabulous garden tea party addition or bridal shower treat with some tea.